II 1998 Mexico (W 13-12) Europe, at Chula Vista, Cal. III: 1999 Europe (W 29-8) Mexico, at Fort Lauderdale, Fla.
V: 2001 U.S.A. (W 21-19) Canada, at Clearwater, Fla.
VII: 2003 U.S.A. (W 28-21O.T.) Canada, at San Diego, Cal. 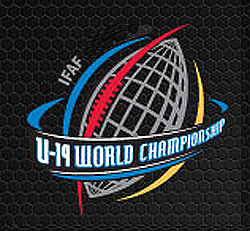 IX: 2005 Canada (W 38-35) U.S.A., at Jacksonville, Fla.
XI: 2007 Canada (W 23-13) U.S.A., at Fort Lauderdale, Fla.
See the IFAF Men's American Football World Cup.